Happy New Year! It's already 2012 and time for Resolutions, which I make sporadically and keep haphazardly! However, this year there area few areas I HAVE to improve in. First, I resolve to stop swearing. This has been an ongoing vice for me but it has really gotten ugly lately. If only certain expletives weren't so versatile; what other words can serve as nouns, verbs AND adjectives, sometimes in the same phrase? Regardless, I've got to stop, probably cold turkey. I somehow managed to raise the two older kids without infecting them, but I fear for my 8-year-old, who is much more impressionable! So, if you're reading this and you know me, please help me by administering any necessary admonishments when I slip up. You'll be doing all of us a favor. Second, I resolve to slow down, particularly when driving. After three speeding tickets in the past two years (Steve from Allstate, please be merciful: Nobody got hurt except my pride! ), I need to become one of those drivers that dawdles down the road in front of you causing you to wonder "What in the heck is wrong with him?" (Notice how I worked Resolution 1 into that last sentence?) It's either that or risk becoming a permanent passenger with Jeanette or Chris as we head down the mountain to work, and nobody wants that. 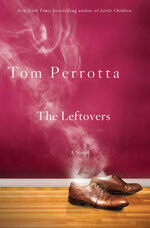 The Leftovers by Tom Perotta. A Rapture-like event has occurred and the residents of a small town are grappling with how to make sense of their lives knowing that for inexplicable reasons they were not chosen. And, at the same time, fill the holes in the town's fabric left by those who were.